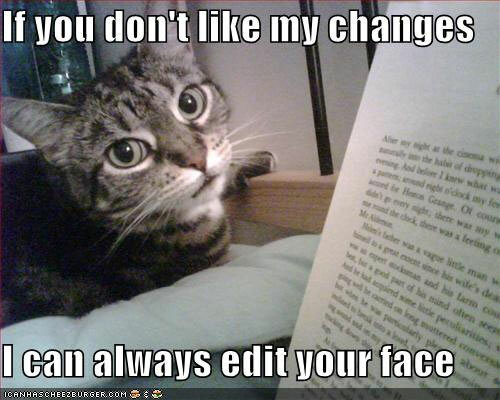 I cannot stress enough to people, readers and authors alike, that proofreading and editing are two different things. The editor’s task is to finesse a writer’s prose so that it observes all the conventions of good writing. A writer may be skilled at explaining a procedure or verbally depicting a scene, but the editor is the one who makes sure the manuscript’s syntax is smooth, that the writing adheres to the conventions of grammar, and that wording is proper and precise and punctuation is appropriate and correctly placed. The editor may also do or suggest some reorganizing, recommend changes to chapter titles and subheadings, and call out lapses in logic or sequential slip-ups. The proofreader, by contrast, is assigned to check a reproduction of what the finished product will look like. And the task is not revision, but correction—making sure that no typographical errors remain from the manuscript or were introduced in the production stage. Proofreaders may also catch grammatical errors or inconsistency of style, and they are often given some leeway to change or at least call out egregious errors, but they’re generally constrained by not being permitted to revise the text in any way that adds or subtracts the number of lines on a page, because doing so may adversely affect the graphic design.